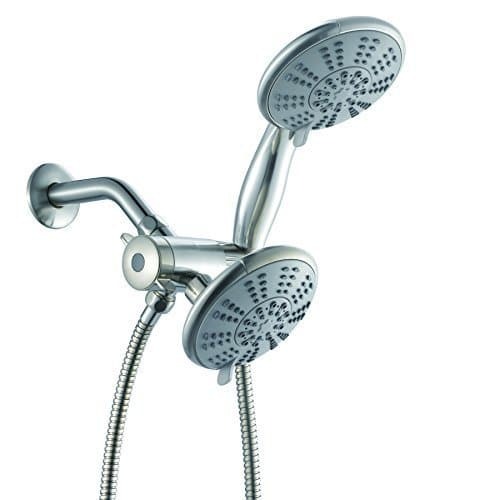 This is the Ana Bath SS5450CBN hand shower head, it is the highest rated shower head I could find when found under our main guide. Today, we are going to review this beautiful piece of art explaining what the features are, advantages, disadvantages, and overall bottom line. When I began researching handheld shower heads, this one came up quite often. It caught my eye primarily because it had a huge amount of user reviews and it looked like a pretty good quality shower head overall. 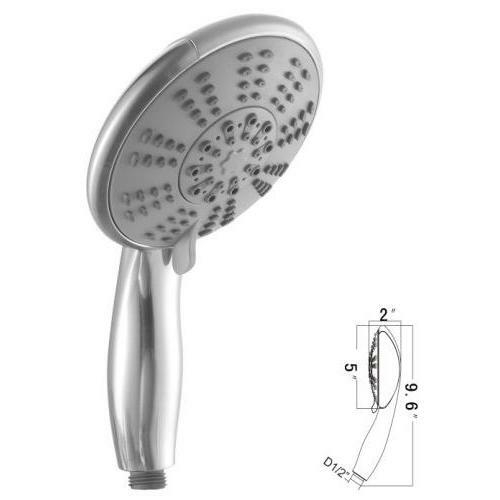 Want To See More Handheld Shower Head? I've always loved the aspect of being able to have a shower head that can spray at all times, and another one which can be detached and used however you want. It seems like this one does just that, and it does it quite well. Being an experienced reviewer, I found most things cant consistently keep good overall reviews when it comes to large volume. When I say good, what I really mean is anything greater than 4.5 stars from 5. A wide majority of things tends to fall in the 4.2 to 4.3 star bracket, it becomes a treat when one consistently keeps a good overall rating. Ana Bath SS540CBN qualifies to be the product that has kept a wide majority of its users quite happy. Let's get into the primary features! The primary feature that I've noticed upon reviewing this shower head, is the dual nature of the shower heads. Each one can be move around to however the user wants, in essence complete flexibility of where the streams of water will be pointing. Now there's other features, below I'll cover them in detail. Anti-Clog Nozzles: This is something that many have today (but not all). Since our water supply is loaded with calcium and other minerals, it tends to build up in places such as the nozzles of shower heads. To combat that, Ana Bath has made them not from simple plastic.. but from flexible silicone. It works like a charm against all types of deposits. Brass Fittings: While at a reasonable price range, they have done well at making prone to breaking parts, strong. First would be the ball joint that is used to swivel around one of the shower heads. Second is the connector where there's the 3-way knob to turn water into the direction of your choosing. Third is the 5 foot long stainless steel hose that feature 2 durable nuts on both ends. All three things just mentioned are made of brass, a heavy and hard metal. Five Unique Spray Settings: Given that there's two shower heads here, you get to choose from 5 of different settings on both. The settings are as follows: Saturating Spray, Massage Spray, Bubbling Spray, Saturating Massage Spray, Saturating Bubbling Spray. They are all distinctly different from one another, quite nice to have a good variety. 3-Way Diverter Valve: Now this is something you'd expect from a shower head such as this, so here you go. It is made entirely of brass which is quite nice, adding durability where its needed. It lets you select from water going to just one shower head of your choice or to both. It also acts as a wand holder if you want all two to have water output. 3 Colors To Choose From: If you are like me, a standard color of anything would do just fine. However with Ana Bath, their SS5450CBN is taken a step further with the colors the provide. You can choose from a good looking brushed nickel, chrome, and oil-rubber bronze color. So as you read above, we talked about the features. Now it's time to cover the advantages you'll receive when using this combo. Some of the things I"ll mention are self explanatory while others not so much. Excellent Water Flow: Some have suffered they were unable to remove water flow restrictors. However it's quite different here. From the dual heads, you can remove their flow restrictors. This results in impressive 2.3 gpm of water flow. Not too bad considering water is being split in two directions. Great Value: It isn't rare to find someone complain about a shower head costing more than 100 dollars, and feeling like it was made poorly. With Ana Bath, it isn't going to be that case. What you'll find here is a complete kit ready to use for less than $60 dollars. That's good value for the money in my book! Dual Output: I thought this would be an excellent advantage for the average user because most of us, are used to only a single shower head. Getting two streams of water not only increases coverage, but also lets you finish sooner. With everything, there are disadvantages. No matter how you look at it, perfection is non existent, but it can be close. Let's get into what we didn't like much with this unit in particular. Spins: Upon closer inspection, I noticed people are having an issue with the shower head spinning from the fixed position you tightened it before. This can be contributed to not having enough teflon or faulty threads. In a broad view, this is a non-issue as it is a problem to less than 3% of all users who have written feedback. Sometimes Need To Remove Restrictor: Not everyone see a single water pressure as adequate, here is no exception. To some when both shower heads are working, the pressure may not be adequate. This is where I recommend you remove the restrictors. So this pretty much the bottom line with this hand held wand, I hope you enjoyed reading this and have a much better understanding of what the Ana Bath SS5450CBN has to offer. Do you want to see a comprehensive guide comparing multiple ones? If that's the case, I have a thoroughly detailed guide on multiple handheld shower heads here comparing a few different ones. I think you'll enjoy reading the page because it gives you OPTIONS. Thanks for reading, please do share this article below if you find it useful!